Last year when British spiritmaker Diageo announced the pending release of an “Orphan Barrel” series – a collection of bourbons retrieved from very aged stock Diageo owns – there was a bit of a schism in the bourbon community. Some criticized Diageo – a company that has among it’s many assets Bulleit Bourbon and the old Stitzel-Weller and Bernheim distilleries – for a lack of transparency in issuing these releases. Chuck Cowdery, the king of bourbon writing, led the charge. It has been his belief that, in not fully divulging the history of each of the Orphan Barrel releases, Diageo is exploiting an over-hyped market and taking money from the naive with flashy packaging. There was another set of voices that defended the Orphan Barrel series, pointing out that Diageo had a very unique and distinct set of products that were very exciting. Bourbon distilled at legendary facilities like Stitzel-Weller and the old Bernheim factory could be assumed to be more ‘craftsman’ than the typical MGP whiskey sourced in so many bottles in the last few years. The reviews were mixed as well. The first release, a 26-year old bourbon named Old Blowhard, was less than well received, with most commenting on the overall woodiness of the release as well as the prohibitive price ($150+). Then came Barterhouse and Rhetoric, two younger, very different and more affordable releases, and more popular in reviews. Meanwhile, the bottles sold out, and Diageo could call the Orphan Barrel series a success. By the time the fourth release, Lost Prophet, was announced in the fall, interest was high. I am coming late to the Orphan Barrel game. Here in Michigan, bottles of Old Blowhard/Barterhouse/Rhetoric started showing up in small numbers last year, but the price, as well as a lack of knowledge, kept it off of my shelf. Bourbon connoisseurs know that age is no guarantee of quality – in fact, very very few whiskeys can stand 20 years in the barrel without coming out tasting like oak tree bark. This is part of what makes drinks like the 20 year Pappy Van Winkle or the older Elijah Craig releases so unique: they retain their flavor even at this advanced age. But not all do – in fact, the 23 Year Old Pappy Van Winkle may be near impossible to find, but the last laugh is really on those who don’t realize it may be the least impressive of the Van Winkles because of that advanced age. Age statements and ‘limited edition’ bottlings are to collectors as catnip is to felines, however, and that is Mr. Cowdery’s main complaint. It would be a fair hypothesis to make that any bourbon producer could find barrels of aged whiskey – regardless of taste, where they were stored, recipe or certainly quality – and make a healthy profit selling them to a relatively unknowledgeable ‘whiskey collector/investor’ base. But is that what Diageo did with their Orphan Barrel series? The truth seems to be somewhere in between. The histories of each Orphan Barrel release can be investigated and found out. The impressive labels and mystic stories not withstanding, these barrels were made by serious, quality companies and stored in historic, if over-hyped locations. Simply storing barrels at Stitzel-Weller doesn’t make the product Pappy Van Winkle anymore than buying a Ford Fiesta from a dealership makes it a Mustang. But that’s not to say it can’t be good, even great. 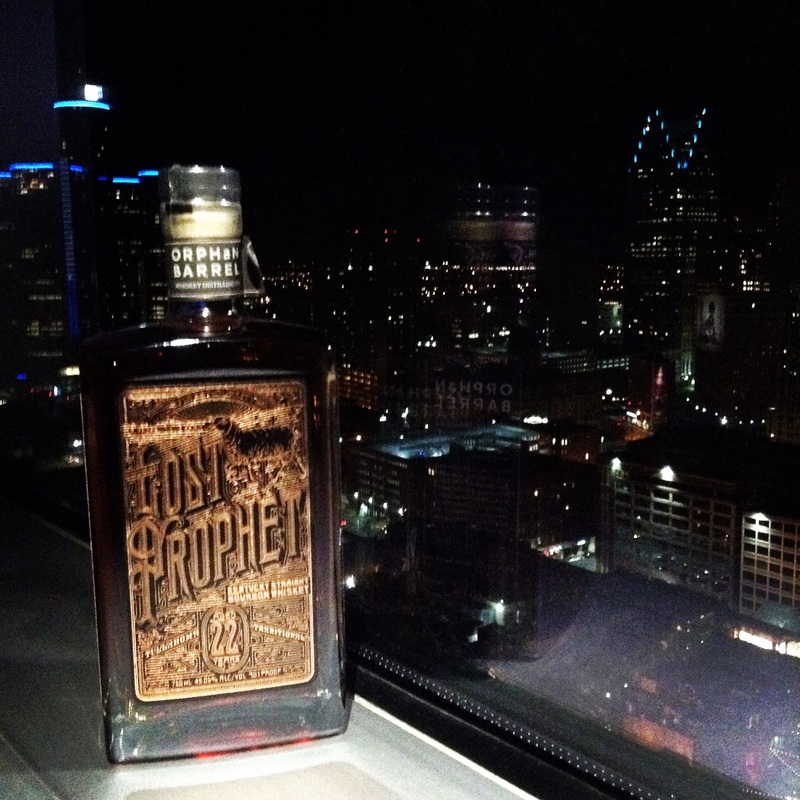 So I start my Orphan Barrel reviews with one of the recent releases: Orphan Barrel Lost Prophet. The story of Lost Prophet is a name dropper’s dream. It was distilled in 1991 at the (1) George T. Stagg distillery. That’s now (2) Buffalo Trace Distillery. It is believed to have been distilled using the Stagg Mash Bill #2 – the same as (3) Blanton’s and (4) Ancient Age (thats 75% corn, 15% rye, 10% barley). It was then moved for storage to the (5) Stitzel-Weller warehouse outside of Louisville. At some point, Diageo became aware of these barrels they had purchased in one of the transactions, and they bottled the results at 22 years. Like I said, a lot of name dropping. But was it any good? We cracked a bottle and had a taste. Dan’s take: Right from the start, this hit me as a different bourbon, and in a good way. The nose didn’t open up to sweetness at all – instead, it was an older, deeper scent. Dried fruits, raisins, a serious dose of cinnamon and clove, touched off with a hint of oak. But that was the biggest surprise – it was a hint of oak. At 22 years, I was expecting a lot more of the charred wood smell, and was pleased to get more texture. The taste did not disappoint. Again, there was a spiciness – cinnamon, clove, plum and a slight bitterness of dark chocolate opening up to a wider leather taste. That bitterness did open up, with a decent taste of the oak, but never overwhelmingly tannin or pucker inducing. And it was shockingly smooth for a bourbon of it’s age. But, just as the nose, there was no real sweetness to be found. The dried fruit taste mixed with oaky smokiness was pleasant and unique though, making this a truly different pour. The finish was long and smoky, with the wooden age lingering. Sometimes, I will try a bourbon that is not to my taste profile, but I respect immensely anyway, and that’s how I feel about Lost Prophet. There are certain times and certain meals I look forward to pairing this well aged whiskey with. On one hand, it is a bit cost prohibitive, at $130 retail, but considering it is 22 years old, worth an investment. And while I sincerely hope Diageo becomes a bit more transparent with their origin stories, I think Lost Prophet is a worthy entry.